Use rollers as a no-heat option for curling your weave. When you have a weave one of the main benefits is being able to style your hair in a variety of ways. However, when it comes to styling your hair, you may find that you either do not have access to heat styling products or perhaps have hair that isn’t 100% human hair, necessitating that you need alternative ways to curl your hair. There are a few non-heat options especially if you have time to let your hair set for the style. Spray hair with a light moisturizer, like KeraCare setting lotion, African Essence or Salon Pro 30 weave spray. Use products like these to keep the hair moist but light enough to make your curls manageable. Comb hair throughout to apply product evenly. Part hair in sections and gather to the tip of the hair in preparation for putting hair in rollers. Use rollers in a size designed to achieve the style you prefer. Consider that the smaller the rollers the tighter the curl. Roll hair from the tip to the base of your head and secure using roller clamps, clips or covers. Repeat this until your the hair is rolled. Tie a scarf over your entire head while it is drying overnight. For thicker, yaki textured weaves, allow 4-6 hours to dry and less time for silky straight weaves. 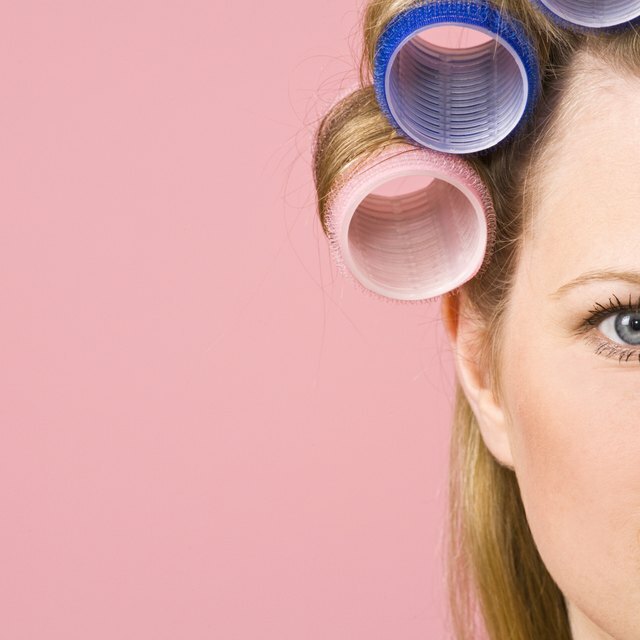 To test the set of the curl, remove the roller from one of the curls on your head. Re-roll if the hair is limp, still damp or not curled. Allow hair to set longer before removing. Purchase a cooling blow dryer from your local beauty supply store. Instead of exclusively heat, this dryer will have settings for both hot and cold drying. Use mousse on your dry hair. Grip two to three inch sections of hair at a time; spray a nickel size amount of mousse on the hair from root to the tip. Choose from mousse products like Bio Silk or Giovanni Air Turbo regular hold. For extra hold on a yaki or Indian remy grade of hair, try HEAD extra hold styling mousse or Bed Head's Foxy Curls Extreme Mousse. Roll the hair with the rollers of your choice and completely roll each section of hair. Start from the tip of each section and roll to the roots of the hair. Secure each roller with its respective clip, clamp or cover to secure. Finish completely rolled hair with an additional spray to speed up the curling process. Spray hair with a light hold hair spray such as Aveda by Aveda, American Crew or Alterna Caviar Shine & Define Spray. Turn the blow dryer on to high speed and on cold. Hold the dryer 4 to 6 inches from your hair and dry for 15 minutes or until fully dry. Remove a roller to test that the curl has set. Once hair is fully dry and curls are set, remove all rollers and style your curls as desired.